When you get off the slopes and you have wicked hat head and it’s too hot for a skully, you’ll need a solid cap. We scoured the apparel catalogs to find just the right hat and we think we nailed it with this Flexfit 6572. It’s got an elastic head band that is one-size-fits “all.” “All” is in quotes, because if you have a giant melon, it might be tight. As long as your hat size is between 6 3/4 and 8 you should be good to go. It’s also mesh, so air can get in and out. 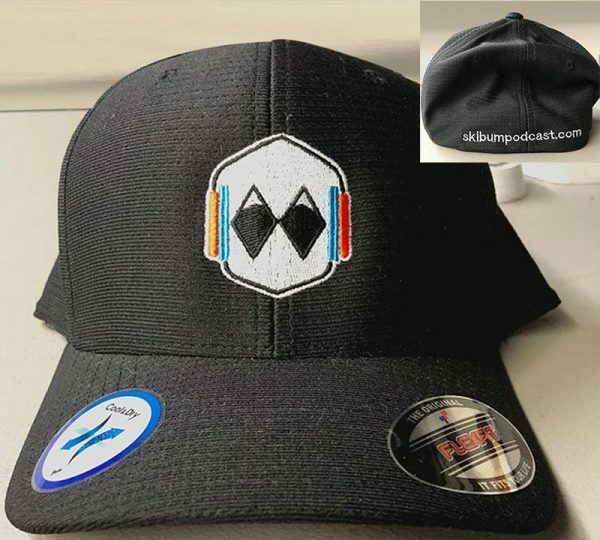 The logo is on the front and on the back it says “skibumpodcast.com.” It’s a 4-season hat. We love it and we think you will, too. When you get off the slopes and you have wicked hat head and it’s too hot for a skully, you’ll need a solid cap. We scoured the apparel catalogs to find just the right hat and we think we nailed it with this Flexfit 6572. It’s got an elastic head band that is one-size-fits “all.” “All” is in quotes, because if you have a giant melon, it might be tight. As long as your hat size is between 6 3/4 and 8 you should be good to go. It’s also mesh, so air can get in and out. The logo is on the front and on the back it says skibumpodcast.com. It’s a 4-season hat. We love it and we think you will, too.